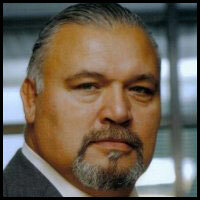 On behalf of the File Hills First Nations Police Service I welcome you to our website. 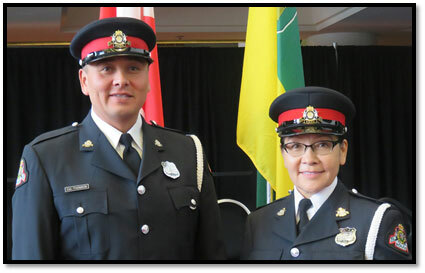 As Saskatchewan’s first and presently only First Nations police service, our members and employees know that not only do they carry on a historic peace keeping legacy but also the hopes and aspirations of the present and future generations of our people. Providing policing services to First Nations communities is by no means a simple endeavour. It presents unique challenges and therefore takes unique skills, knowledge and abilities not often required in mainstream policing. As many First Nations lack both infrastructure and resources more common elsewhere, our communities look to us to provide leadership and to be a social safety net when necessary. We are under no illusion that this is a task we can accomplish alone. We are committed to continuous improvement and to that we need the help of our people. We need to know what their wants, needs and expectations are of us. We need to know how we are doing and to be held accountable. Not only does the FHFNPS want to be held accountable…. We demand it! We are proud and honoured to accept the challenge and have enshrined the key values to do so in the oaths we take when we agreed to accept the responsibility the Creator and our communities have entrusted us with. We are determined to be oath keepers, not oath breakers. 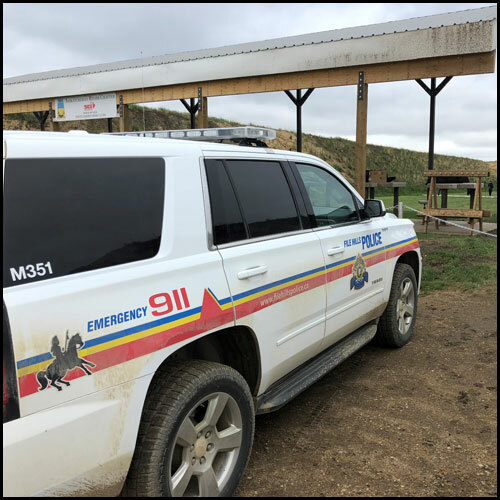 On November 13, 2018, members of the File Hills First Nations Police Service were called to a residence on the Little Black Bear First Nation regarding an adult male that had been found deceased at his residence. The File Hills First Nations Police Service has requested the assistance of the RCMP Major Crimes Unit South and the Forensic Identification Section from Regina to assist with the investigation. Both units are currently on scene and working with members from File Hills Police. The Saskatchewan Coroners Service is also involved with the investigation. An autopsy was completed in Regina and results are pending. The File Hills First Nations Police Service and the File Hills First Nations Board of Police Commissioners are happy to welcome Mr. Victor Starr on board as our Community Cultural Support Liaison worker effective November 1st, 2018. Mr. Starr brings with him a wealth of cultural knowledge from all the communities we serve and we know that his knowledge and experience will be a great asset in helping us to continue to deliver a culturally sensitive and appropriate police service delivery. In addition we believe that his impressive educational background and varied work and life experience will also serve us well in mobilizing our communities to work towards ensuring that all aspects of the justice system are culturally relevant and adapted to the needs of Indigenous peoples. 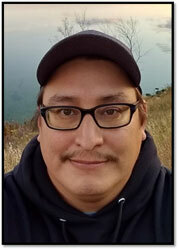 Mr. Starr is a member of the Star Blanket First Nation and a resident of Wahpiimoostoosis. The File Hills First Nations Police Service is holding the "Treaty Four Strong Arm of the Law Arm Wrestling Tournament" on September 15, 2018, in Fort Qu'Appelle on the Treaty Four Grounds. 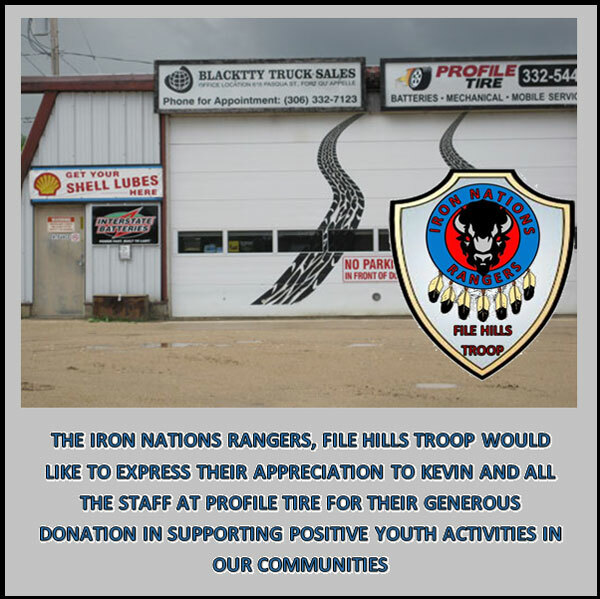 More information can be found here or by calling Paul Avanthay at 306.334.3222. 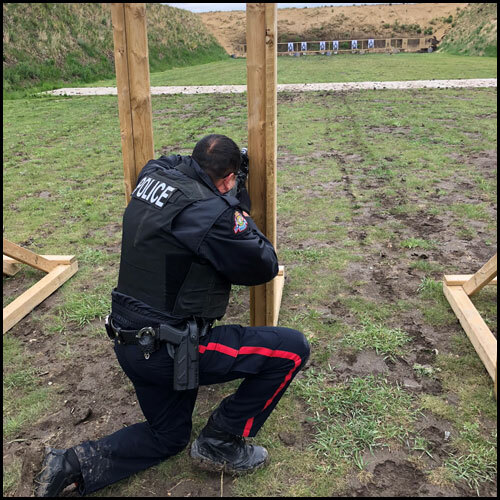 Over the course of the last week, members of the #FileHillsPolice attended training with the Saskatoon Police Service. This intense and physically demanding course was successfully completed. What does this mean? In the future, you may see our members carrying a patrol carbine/rifle when responding to high risk calls for service. The File Hills First Nations Police Service welcomed their newest member, Staff Sargent Paul Avanthay at a swearing in ceremony at the Okanese office on February 16th. Originally from Grand Rapids, Manitoba and a member of the Peguis First Nation Paul comes to us from Norway House, Manitoba where he was the NCO in charge of the RCMP detachment. He has just completed a 25 year career with the RCMP where he served as detachment commander at locations such as; Little Grand Rapids, Peguis, Shamatawa, and Fisher Branch. Throughout his career, first with Canadian Armed Forces and then the RCMP, Paul served in numerous locations abroad and in Canada and in a variety of roles. He has been recognized for bravery and good service throughout his service. "Paul functioning as our Operations NCO will bring a breadth of experience and leadership to our day to day operations that will both enhance our service delivery and ensure the stability and continuous improvement that all police services must strive for. We are delighted to have him on board." On Friday December 15th a police graduation ceremony took place at the Conexus Arts Centre in Regina. Recruit Class #75, a group of 20 cadets from Saskatchewan and Manitoba, became sworn police officers in a formal badge presentation ceremony. As the culmination of almost 6 months of intense training it was a very proud occasion for all the graduates and their families as well as the staff at the Saskatchewan Police College. What made the event especially proud and memorable for File Hills First Nations Police Service Constable Justin Thomson, and his family, was the fact that his badge was pinned on his tunic by his mother! 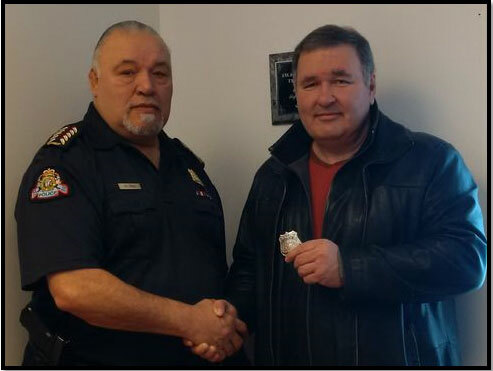 While it is not uncommon for a new police officer to receive their badge from their father who is or was a serving police officer this particular occasion stands out as a milestone because this is the first time in Saskatchewan that a new police officer has received their badge from their mother. Corporal Carol Thomson is also a serving member of the FHFNPS and has been with the File Hills Police Service for 4 years. Prior to joining the FHFNPS she served as a member of the RCMP for 25 years. "It was a touching and emotional moment for everyone there. Once the badge was pinned on there was a slight break from protocol as a very proud mother couldn’t resist giving her son a hug which was loudly applauded by everyone in attendance. What a great start to what we know will prove be a very promising career for Constable Thomson." The File Hills First Nation Police Service 2016-2017 Annual Report and the 2016-2017 Annual Audit are now available online. Since 2010 approximately 50 people have died in Saskatchewan as a direct result of Fentanyl, 22 in the last year and many more have suffered the severe physical and mental effects of this deadly drug. Many of these people are members of our First Nations communities here in the province while other provinces are reporting even higher deadly and tragic Fentanyl related incidents. Often sold as fake OxyContin many new and experienced drug users are unprepared for its deadly strength and effects. A fentanyl overdose will result in several characteristic physical symptoms. These symptoms will be easily observed by those who know what to look for, and include: confusion, dizziness, difficulty thinking, speaking, or walking, pale face, blue- or purple-colored lips, fingernails, or extremities, throwing up, choking sounds, pinpoint pupils (pupil size reduced to small black circles in middle of eyes), seizures, slowed heart rate, excessive drowsiness, frequent fainting spells (nodding off), limp body, unresponsiveness, difficulty breathing, hypoventilation (slow, shallow breathing), respiratory failure, … Death. If you suspect someone is suffering from a drug overdose call 991 immediately! On December 16th after completing 5 months of rigorous training Cst. 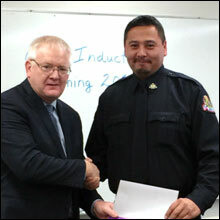 James Stagg graduated from the Saskatchewan Police College in Regina as a Police Officer. The graduation ceremony started in the morning with fitness, defensive tactics and dismounted cavalry drill display at the University of Regina. This was followed by the badge presentation at the Conexus Centre that afternoon and a banquet at a down town hotel that evening. 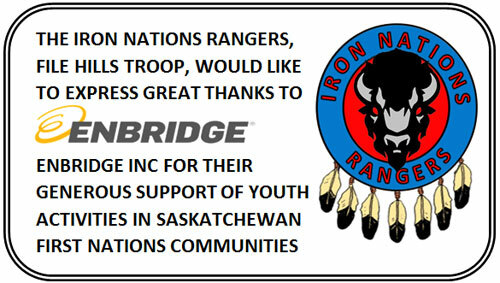 Present were Government dignitaries, Saskatchewan Chiefs of Police and the 16 members of Troop 73’s families and friends. 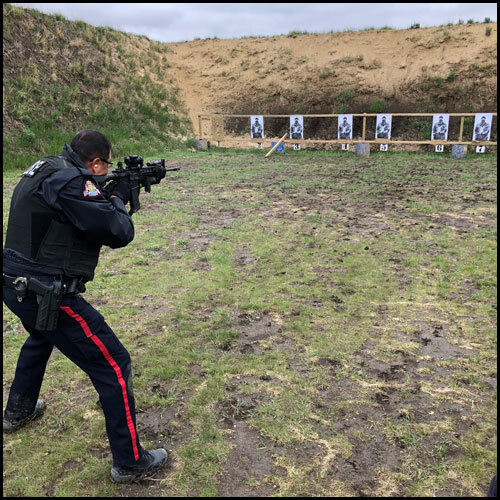 Cst Stagg, a member of the Brokenhead Ojibway First Nation, came to the File Hills First Nation Police Service in January, 2016 and served as a Special Constable for 6 months prior to going to the SPC for basic recruit training. Prior to joining the FHFNPS Cst. Stagg had taken Police Studies at Assiniboine College in Brandon Manitoba and had then worked as a Border Services Officer for the Canada Border Services Agency on the Yukon – Alaska border. 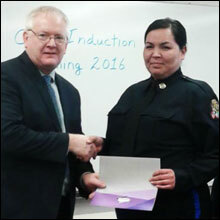 On December 16th File Hills First Nations Special Constables; Vanessa Star (Peepeekisis) and Justin Thomson (Carry the Kettle) graduated from the SIAST Community Safety Officer Induction Training Course in Prince Albert. A CSO is a Community Safety Officer who has been designated by the Province of Saskatchewan as a Special Constable. The CSO can enforce Provincial statutes such as the Traffic Safety Act, Alcohol and Gaming Regulations, All Terrain Vehicles Act, as well as the Provincial Acts. In addition, the CSO's will also be able to enforce First Nation Law. The Community Safety Induction Training program provides a peace officer-level of training that includes 19 days of on-site courses in defensive tactics, tactical communication, law and the criminal code, traffic training, interviewing and report writing. This is combined with 11 days of online courses in mental health, crisis intervention, CPIC, and investigations. "The training blends practical applications with online learning curriculum components from the Canadian Police Knowledge Network. "I congratulate these members on what they have accomplished. This training will certainly enhance the basic Special Constable Training our members have already undergone and will allow us to continue to improve our service delivery to our communities." 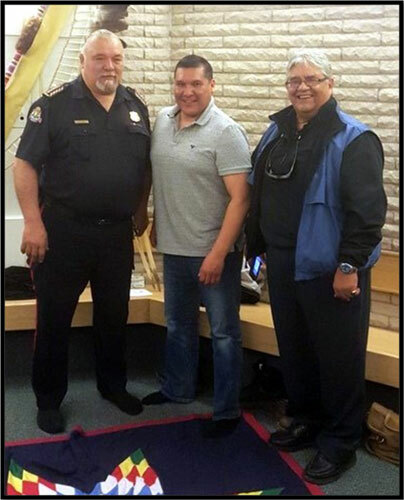 On April 26th, at a traditional swearing in ceremony, Constable Larry Bigknife was welcomed into the ranks of the File Hills First Nations Police Service. 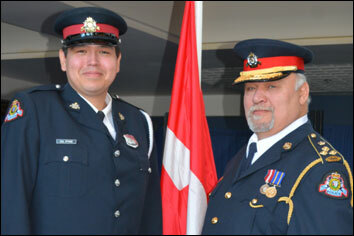 Larry Bigknife, a member of the Star Blanket First Nation, has just completed a 25 year career with the RCMP. During his career in the RCMP, Larry acquired an extensive background in general duty policing, community policing, criminal intelligence and in police managerial practices. The File Hills First Nation Police Service Newsletter for March 2016 is now available. Download an application form to start the recruiting process. Front office hours: Weekdays 9:00 a.m. to 5:00 p.m.